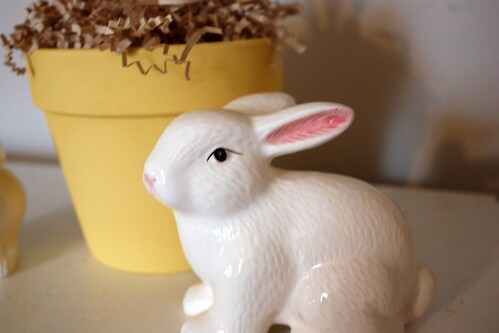 Things are finally starting to feel a little like Spring around here, which means that its time to get some Easter decorations out! 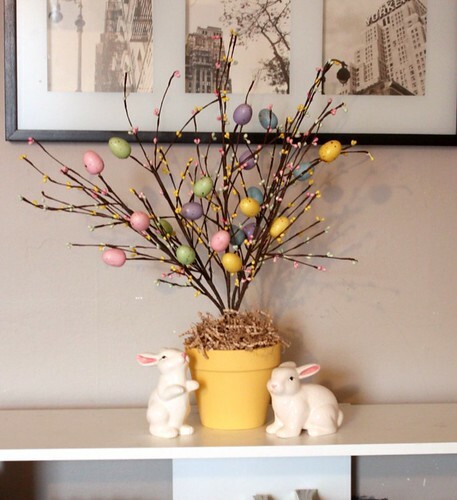 This year I decided to make a little Easter Tree to put on the bookshelf in the living room. It seemed like just the ticket for brightening the place up for the new season! 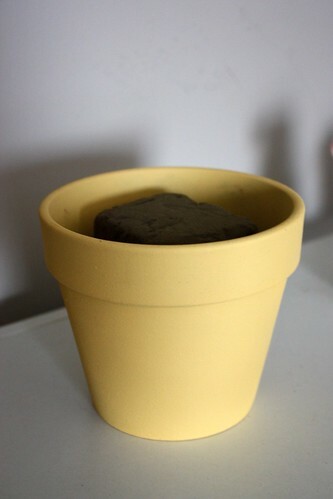 I tried to use some things that I already had like the terracotta pot, paint and filler, and in the end the whole project only cost me $7, including the bunnies! Not bad considering how expensive a tree like this would be from a decor store. 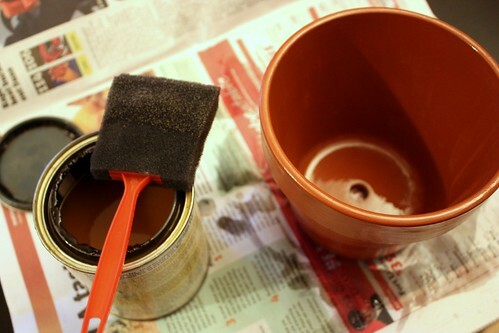 To start off, I applied shellac to the interior and exterior of the pot. Using a foam brush, I made a thin layer, allowed it to dry and then applied another thin layer. Just to be sure that it was no longer sticky, I let it completely dry overnight. The next morning, I used a small foam roller to apply pale yellow acrylic paint. To prevent any uneven areas, I did several thin layers, allowing drying time between each coating. Once it was completely dry, I cut a piece of craft oasis (foam) to fit the inside. These sticks made the tree so much easier to made. 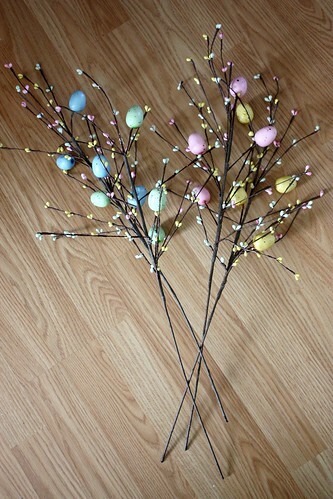 Originally I was going to attach my own plastic eggs to branches I found outside, but when I noticed these at the dollar store (Dollarama, for all you fellow Canadians) I realized that my work was done for me. 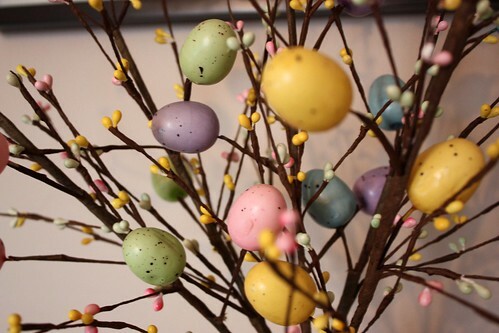 At $1 a branch, I picked one in every colour – pink, yellow, purple, green and blue. I love the sweet little buds and the speckled details in the eggs. I still can’t believe that these were only a dollar! Before putting the branches in, I made sure that the oasis block was firmly in place. 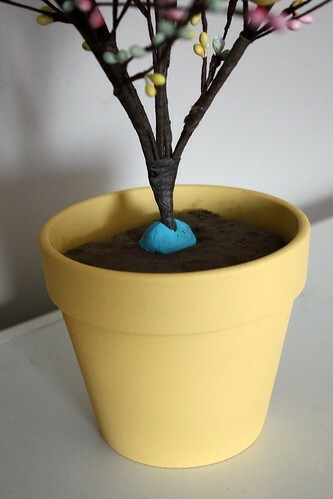 I cut the branches to the desired height, then wrapped them together with some brown florists tape. I didn’t want them to wobble in the oasis, so I wrapped some blue poster putty around the base to secure everything. 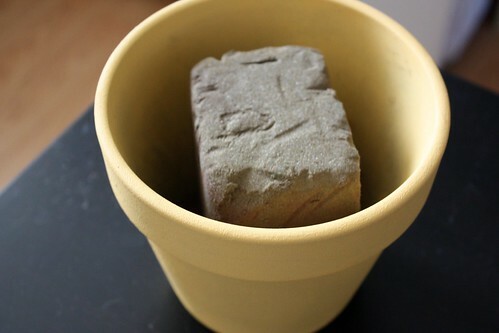 To hide the oasis and the putty, I used some packing grass that I had from a package that was delivered. Its nice to find a way to reuse something like that! These sweet little bunnies were also a dollar store find. Originally I was going to paint them over with matte paint, but in the end I loved the little hand painted details, like the nose, ears and eyes. 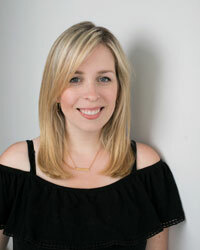 Its amazing how a little bit of colour in your apartment can do wonders for your mood! Next time I made something like this, I might take the time to grow some real cat grass to have along the edges, but that takes about two weeks of forethought, and I’m lucky if I have two hours. 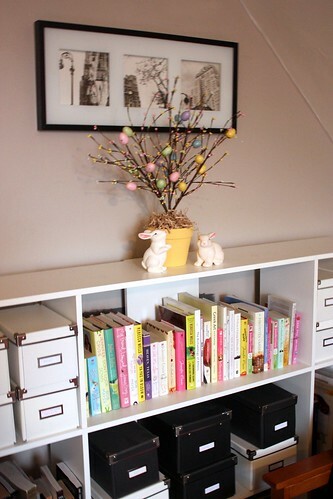 To keep with the theme, I also rearranged the books on the shelf to try and match the Spring colours. I usually keep them organize in a rainbow pattern (or even red and pink for Valentine’s Day), but this decor just seemed to call for pastels. I’ve made a few other little Spring tweaks to the apartment lately and I’ll be sure to post them this week. 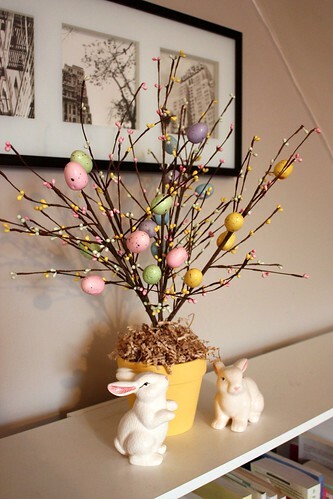 Have you been doing any Spring decorating? How excited are you for warmer weather to be on the way? 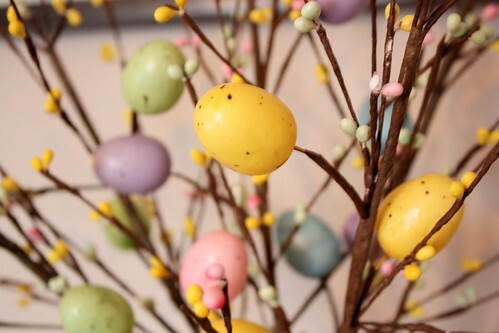 Love the Easter tree. You always decorate for holidays in the most creative ways!